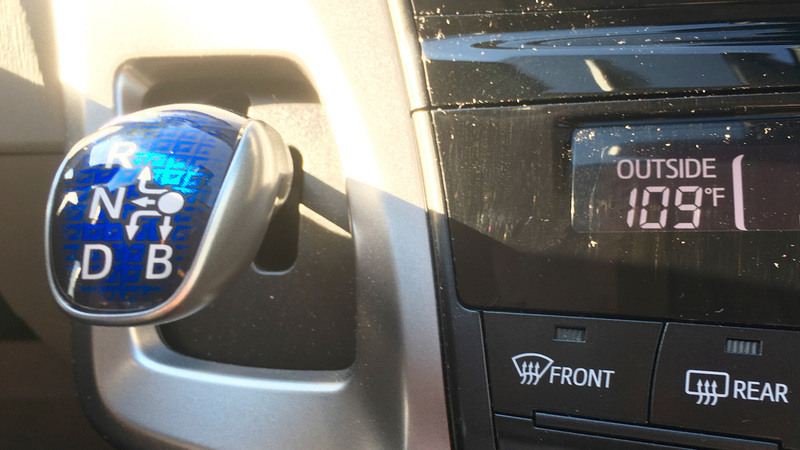 The Prius shifter is unapologetically a joystick. And yes, Phoenix, AZ gets a bit toasty in the summer. My favorite feature in my Prius is the one in the hero image above: The gear shifter is, unapologetically, a joystick. The shifter tells you by its shape and design that you are performing no mechanical action—you are telling a computer what your intention is, not actually initiating the action yourself. For car nerds this is sacrilege—the enjoyment of the car is tied to your connection to the vehicle, your physical involvement with the iron that makes up the car. And the Prius puts the fact that it’s all fly-by-wire right in your face. You can compare with BMW piping pre-recorded engine sounds through the vehicle’s sound system in a misguided effort to help the driver feel more in touch with the machine. Because no matter how much Potemkin feedback car manufacturers add to their products these days, a modern car is a computer on wheels. And that’s a good thing—I’m old enough to have spent my childhood and early, formative, driving years in analog cars and they were terrible. Constant breakdowns. Slurping gas like an Amy Schumer character slurps white wine. Constant leaking of mystery fluids. Gearboxes that grind. Cars were a mess back then. But we didn’t know that because the concept of a car that mostly just worked was unthinkable. And of course being a teenager, the freedom of the car and the open road, parking with a person of your preferred gender, these are powerful experiences and feelings that a lot of people have transferred into the bucket of bolts that broke down on them all the time instead of their youth and hormones. Which doesn’t make it wrong for a person to enjoy tinkering with an old car in their spare time—on the contrary, whatever constructive hobby a person can find is a great thing and I hope it brings you happiness. But as the defiant little joystick in the Prius shows, cars are moving to a much better technological place. And that is something that should be celebrated. And props to Toyota for being completely unapologetic about it.